A guide on how to use the library and its resources to do research and find books & e-Books, journals & articles, videos & music, and other materials. Welcome to the San Juan College Library! This guide will assist you with using the library and its resources to do research and/or to find books & e-Books, journals & articles, videos & music, and other materials. 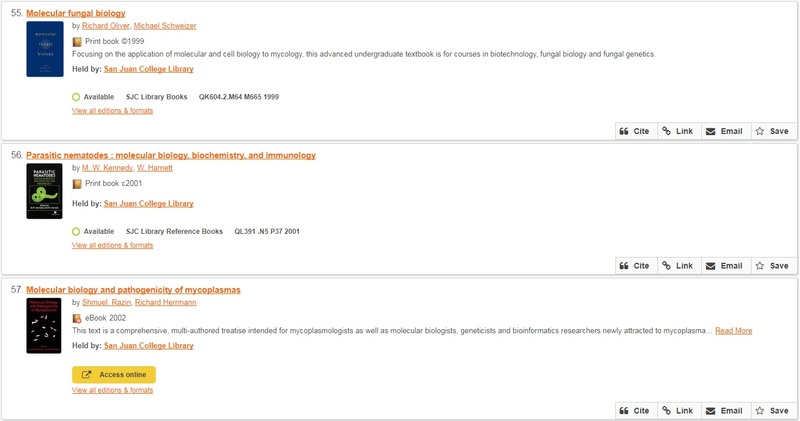 The library website (http://sanjuancollege.edu/lib) will be your starting point for searching the catalog for materials, accessing databases for research, and also for general information about the library. Take a few moments to explore all the library has to offer. Don't be too shy to ask if you have questions or would like help. Librarians and library staff members will gladly assist you. Libraries Worldwide is the default search setting. It is not necessary to change this setting. 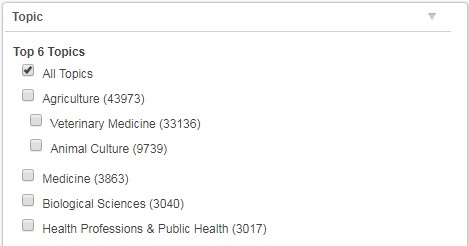 Search results will always display SJC Library holdings first. It is more important to filter/ narrow search results by Format (book, article, video, eBook, etc.). When filtering search results by Article or Article/Chapter, be sure to always click the Full Text checkbox under the Content filters. This ensures that all articles in the search results contain the full text of the article and not just a preview or summary. If your assignment requires you to use scholarly/academic or peer-reviewed sources, click the Peer Reviewed checkbox also. Click the image below to view sample search results. Information concerning the format of the item (whether it is a print book or an e-Book or an article, etc. ), whether the item is Held by SJC Library or by an outside library, the availability of the item, which area or collection within the library the item is located, and the call number (where the item is found on the shelves) is displayed for each item. Items accessible online, such as articles or e-Books or e-Videos, will have a yellow View Full Text/ View eBook/ Access online link displayed. Simply click on the link to be taken to the item in whichever database it is stored. There are many options to filter or narrow your search results. You can filter by format (print book, e-Book, journal/magazine, article, video, etc. ), by author, by a specific date or date range, by topic/subject, etc. Click the images below to see examples of available search filters. For physical items (print books, DVDs, etc.) located at the Main library or West campus library, you may request item(s) be placed On Hold for you to pick up at a later time. To place a hold, click on the item's title in the search results list. More information about the item will open to the right side of your screen. Click the yellow Place Hold link and login with your SJC username and password. Select which location you would like to pick up the item and submit your request (items can be sent to whichever campus library you choose). For items not held by SJC Library, you may submit a request through the Interlibrary Loan (ILL) service. You may request physical items and articles (including electronic/online articles), but not e-Books or e-Videos. To request an item through ILL, click on the item's title in the search results list. More information about the item will open to the right side of your screen. Click the yellow Request Item through Interlibrary Loan link, then fill out and submit the online request form. Items may take 7-10 days to arrive, depending on the item and where it is being sent from.